Well-known musician and Paradise Valley resident John Mayer, says he has made a “true connection” with Montana after singing for the first times in two years since throat surgery. 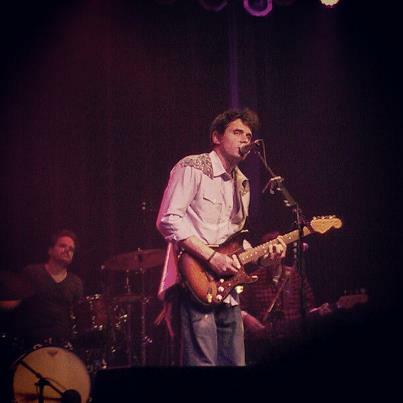 Nationally renowned singer-guitarist John Mayer performs earlier this month in a benefit for those who battled the Pine Creek Fire last summer. Mayer performed a benefit concert Friday night to raise money for firefighters who fought the Pine Creek fire in Paradise Valley last summer. Methamphetamine use has not significantly decreased since the implementation of the Montana Meth Project ads in 2005. The graphic ads depict the adverse affects of meth use in an attempt to dissuade meth use, particularly among the younger demographics. Advocates for public parks in Bozeman would like to find a new and better way to fund the growing number of city parks and trails, and that may include a new tax. On the heels of a $15 million parks and trails bond that was overwhelmingly approved by voters last November, David Cook, chairman of the Parks and Recreation Advisory Board, thinks it’s time to get serious about how the city funds its Parks department. Disabled skiers and riders will have a much easier time accessing the eastern slopes of Bridger Bowl next winter season. Bridger officials last week announced plans to make the mountain more handicap accessible and beginner friendly by installing two chairlifts. The current Alpine lift, a bright red, iconic double-chair that has made its rounds since 1967, will be taken down. In its place a pair of new triple chairlifts with loading carpets will be constructed to better service the Alpine terrain area. Eagle Mount, a nonprofit organization that helps disabled and handicapped people enjoy the mountain, supports Bridger’s decision to replace the lifts. Campus tobacco ban just so many words? Montana State University became tobacco-free in August of last year, but MSU police have not issued a single citation for violations and there is no set mechanism in place to enforce the ban, according to campus officials. Since then, according to campus police, they have not given out a single citation for on-campus tobacco use. In fact, if a repeat or problem violation occurs, it will be handled like any other conduct issue on campus. Recent mass shootings have sparked social media site rumors that Walmart is discontinuing the sale of ammunition and the AR style semiautomatic rifle blamed for many shooting deaths. The rumors have caused mass buying among consumers, and in years past led to ammo rationing and limits on purchases per day. Approximately 85 Montana State University students and members of the Bozeman community gathered in the Strand Union Building Thursday to participate in the fourth annual Hunger for Change Fast-a-Thon, an event designed to help counteract the growing issue of hunger in the Bozeman area and raise awareness for the needy. According to Lori Christenson, program coordinator of the Gallatin Valley Food Bank, requests for emergency food box services have increased by about 7 percent in the last year alone. Approximately 12.5 percent of community members – or one in eight people – receive varying levels of assistance from the food bank, and an average of 5,861 pounds of food is distributed per operating day, Christenson said. While the flu is spreading at epidemic rates on some states, Montana is experiencing a mild flu season compared to other years. And Montana has been spared the vaccine shortages that have plagued some states. Snowpack in area mountains has tapered off after getting off to a better than average start this winter. But water content in the snow remains high. Recent data collected and provided by the National Resources Conservation Services (NRCS) has seen a gradual decrease in snow depth at a number of Gallatin County Snotel sites in the absence of any new substantial snowfall.